There is more and more fuss about Phase Change Materials, better known as PCMs. Experts say they are close to maturity as solutions for thermal energy storage (keeping energy as heat or cold over a period of time. ), both in the industry and in buildings! But what do we actually mean by PCMs, and will they become that important in Norway? First, what do we mean by Phase Change Materials? I hear more and more people talking about Phase Change Materials. You have certainly used one already, e.g. with your portable isothermal bag (cooling bag) when you go to the beach and you want to keep your food and drinks cold. Just as you can keep things cold with a Phase Change Materials, you can also use PCMs to keep things warm. PCMs are very versatile and definitely an exciting topic. However, I have realized that most people don’t really know what these materials are and the basic principles to use them correctly. When a solid material is heated to a temperature above its melting point, it will absorb the heat and melt. Same as an ice cube will melt while absorbing the heat of your soda to keep it cool. On the other hand, when we cool down a liquid below its melting point, it will solidify at quasi constant temperature, like when we put water in the freezer to make ice. To fully melt or solidify, a material needs to absorb or release a certain quantity of energy called “latent heat” or “heat of fusion”. 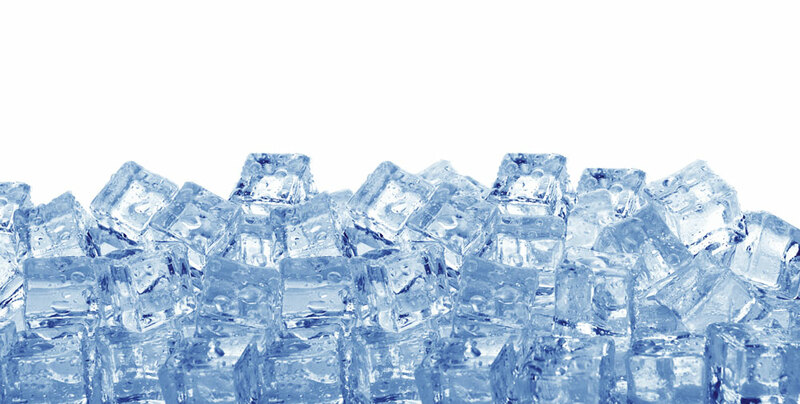 Ice-water was already used as a PCM by Persian engineers as far back as 400 years BC to chill food treats for the royalty. In other words; PCMs are materials that, when they change phase (melt or freeze), absorb or release heat at a nearly constant temperature, and by doing this can be effectively used to store heat or cold. For example; the heat of fusion for water at 0 °C is 80 times larger than the heat you need to warm up liquid water by 1 degree Celsius. Thus, the science with PCMs comes down to a very simple goal: controlling how a material melts and re-solidifies, so you can use this material as heat storage. Yet, controlling the phenomenon is not that simple! What materials can be used as Phase Change Materials? The next question I often get: what kind of materials are we talking about? Well, pretty much all materials have the ability to melt and solidify. However, not all of them will do it in a useful temperature range or in conditions that are possible to control without degrading after several repetitions. While water is the most known and used PCM, other commonly found PCMs are e.g. salt and water mixtures. In Norway, the most typical utilisation of these mixtures are on the winter roads: salt crystals spread out on the road will mix with rainwater to lower the freezing point below 0 °C, thus preventing ice formation until the air temperature is well below zero degree Celsius. Another example is alcohol mixed with water. This mixture also helps to shift the freezing temperature below 0 °. How much below depends on the rate of alcohol. This is the trick used for the winter mix of windshield washer fluid, preventing it from freezing even in the coldest days of the Norwegian winter. How much alcohol or salt you mix matters a lot: for example, vodka would never freeze in your freezer, while beer would (and eventually expand and break its container). Vodka would never freeze in your freezer, while beer would (and eventually expand and break its container). For higher temperature, paraffins, e.g. wax, and several types of sugar alcohols are commonly used to store heat. For instance, erythritol (a sweetener to substitute sugar) has been widely investigated for heat storage due to its low cost and convenient melting temperature at 118 °C, just above the water boiling temperature. At even higher temperature, melting and solidification of metals has been studied for millennia to be able to cast any shape. Phase Change Maretials are gaining a lot of attention these days, because their readiness level (TRL) is close to commercial use for thermal energy storage; This means to absorb heat or cold when in excess, and deliver it back later when needed. Ideally, the goal is to store heat or cold similarly to how we store electrical energy in batteries, using charging and discharging phases. Compared to other methods to store heat, Phase Change Materials make thermal storage units more compact and can operate on a narrow temperature range, which means lower heat losses. Since the melting and solidification occur at a nearly constant temperature, it is possible to store large amounts of thermal energy from hot or cold flows, only a few degrees above or below the operating temperature. Thermal energy storage is of high interest in the industry, where large efforts are undertaken to reduce overall energy consumption and avoid wasting excess energy. 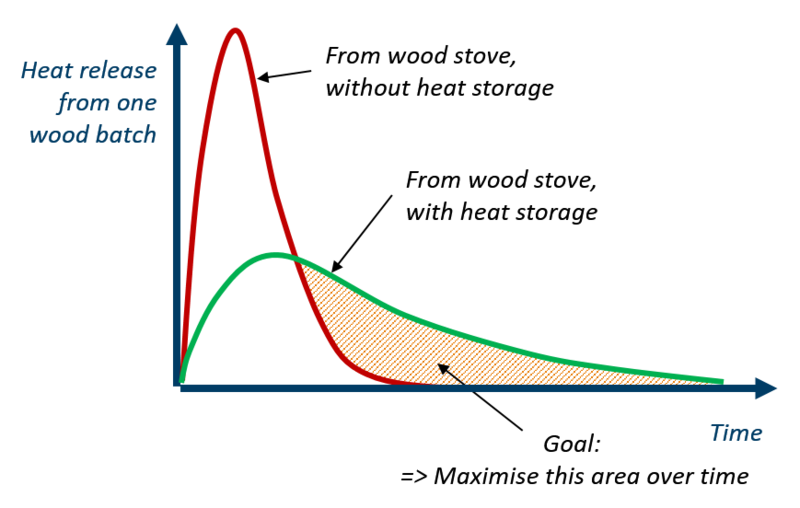 Another advantage of thermal energy storage is the ability to flatten the energy consumption through peak shaving. By storing heat or cold during low demand and delivering it back during peak demand, we can install smaller heating or cooling devices and reduce investment costs. This advantage, coupled with a future perspective of much higher energy price during peak demand, is precisely what will speed up the implementation of PCM-based solutions in Norway. The future perspective of much higher energy price during peak demand is precisely what will speed up the implementation of PCM-based solutions in Norway. Foreseeing that peak shaving is gaining priority in Norwegian and international energy policies, and being well aware of the pioneer role that Norwegian industry generally holds with thermal energy technologies, SINTEF has bet on Phase Change Materials as one of the best upcoming technologies for thermal energy storage. With the research project PCM-Eff supported by basic funding from the Research Council of Norway, SINTEF Energy Research is building knowledge on the design of heat exchangers using PCMs to achieve effective thermal energy storage in various applications. Research activities on PCMs also take place in other large projects, such as FME HighEFF and the KPN WoodCFD. One example of Phase Change Material application focuses on wood stoves. In new, modern buildings, thermal insulation is so effective that wood stoves often overheat the house. 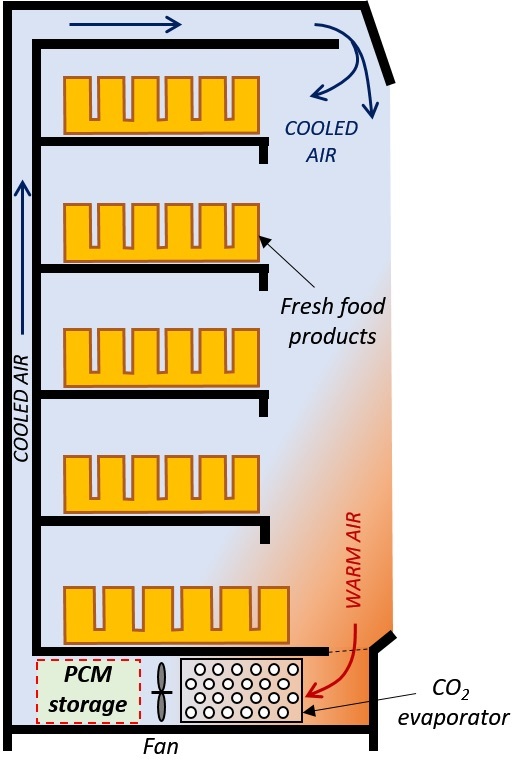 One solution is to develop a heat storage using PCMs to absorb part of this excess heat before it reaches the room and deliver the heat back also after the combustion ends. This contributes to increase the duration of the heat release to the room giving greater thermal comfort in the house for a longer period of time. In the PCM-Eff project, one concept has been numerically tested and provided promising results that attracted the attention of the Norwegian wood stove producers. Another promising example in focus in the PCM-Eff project is the integration of a PCM-based cold accumulator in refrigerated food display cabinets such as those found in supermarkets. The cooling of every display cabinet is switched off several times a day to avoid building ice on the heat exchangers, namely evaporators, that cool down the circulating air. These periods without cooling are called defrosting cycles. The PCM-unit would store cold during low demand periods and can provide free cooling when the general cooling system goes through defrosting cycles (to avoid building of ice in the system) or during power breakdowns. Free cooling can also be provided during night time, when the doors of the display cabinet remain closed for several hours. Since the first results are promising, further efforts are on-going to refine the design and test the concept experimentally. Beyond thermal comfort and fresh food preservation, the applications for Phase Change Materials are many and the topic is of high interest worldwide. There are examples studied in Sweden of PCM-based heat transport by truck from one industry in excess of heat to another in need of heat. Another fast-growing application is the PCM heat storage unit coupled to Concentrated Solar Plants (CSP), storing heat at more than 400 °C during sunny hours and delivering the heat back the rest of the time. The first commercial solutions are now in deployment for large scale heat storage. All types of industries can find in PCMs a viable interest. Though the previous paragraphs may make it look simple, designing heat exchangers using Phase Change Materials to store heat or cold remains full of challenges. But, choosing the proper PCM for a given application was the first challenge to overcome (Methods were developed). Phase Change Materials, though interesting for their adapted melting point and commercial availability, have other properties that should be considered. For example, the above-mentioned mixture of water and salt can be corrosive for the heat exchanger. Think how corroded your car or your bicycle chain is by the end of the winter! Paraffins, which are very attractive to operate around ambient temperature, are generally flammable and might not always be adapted to applications in buildings due to fire safety. Beyond that, some materials do not melt uniformly, forming different phases, which makes it impossible to melt and solidify them in a reversible way, as a thermal energy storage unit should operate. The PCM volume might expand or shrink by 10-20 % while changing phase, depending on the material properties. The durability of the material through cycles of phase change is a crucial aspect to consider. The durability can also be negatively affected when the PCM undergoes temperatures well above its melting point. Therefore, the temperature has to be properly controlled in each corner of the PCM storage to ensure the durability of the system. Finally, the design of the heat exchanger using PCMs must make it possible to match the heat transfer rates necessary to absorbs all available excess heat (or cold), and deliver it all back when required. Increasing the heat transfer rates through PCMs is currently a topic in high focus in research worldwide. Another challenge here is that each application should have its custom-designed solution depending on the available heat source and heat sink. More info about those technical challenges can be found here. Beyond the PCM-Eff project and other mentioned projects, we are involved in an exciting spin-off project on-going with NTNU and SINTEF Building and Infrastructure about the new ZEB Flex Laboratory. The 2000-m2 building is to be erected on the Gløshaugen Campus in Trondheim. Both a lab and an office space, the building will pack innovative technologies for heating and cooling. Thanks to funding from ENOVA, we will be designing a PCM-based heat storage unit capable of storing excess heat from the building’s solar roof and contribute to heating the building when needed. Another on-going development to be mentioned is the application of Phase Change Materials in deep-freezing processes. This is especially relevant in Norway for the food processing industry, which faces tons of fish or meat products to deep-freeze within a short time, generating high peak demand from the electricity network. Studies performed through FME HighEFF showed promising results. Beyond saving money on the electricity bills by reducing half of the maximum power demand, the savings in the cooling system’s compressor size and specific energy use per ton of products to freeze are also attractive. A dedicated spin-off project for PCM-based cold storage is currently in the making in collaboration with NTNU and SINTEF Ocean. But we want to do more and launch new projects. Our goal is now to demonstrate to the Norwegian industry that using PCM-based technologies for thermal energy storage is a reliable and viable solution. From the cited examples of applications, a dialogue has been established with the relevant industries in the view to work together in spin-off projects. These projects provide a great platform to, together with the industry, learn how to design efficient thermal storage units that would best fit their applications. The outcome is to have demonstration units and prototypes in place within the next years. Will you take the challenge and be our next partner?